Hypertonicity occurs when a muscle has too much resting tone. Hypertonic muscles can be short or long and will tend to cause deviations in normal posture. For example the dog may stand differently, drop their pelvis underneath them or alter their neck or tail carriage. Hypertonic muscle will tend to be hard and inflexible to the touch which in turn decreases its ability to lengthen and contract efficiently and so inhibits normal movement. Hypertonic muscle can look as though it is bulging, feel hard and inflexible, produce a pain response and give off a dull nagging chronic pain. The great thing about hypertonicity is that responds almost immediately to massage. Tightness refers to a muscles resting length. Tightness can also be seen as stiffness and lack of range of motion when the dog is on the move. A tight muscle will often be uncomfortable on a day to day basis, can get worse after rest and loosen up with exercise. Although some people use the terms interchangeably there is a difference and both of them can exist together or solely. Tightness will over excite sensory receptors called Muscle Spindles which are responsible for detecting changes in length. When muscle is tight the fascial environment becomes abnormal as its web begins to tighten disallowing normal muscle function and producing nociceptive pain. A tight muscle is a sick muscle and it is more prone to the injury the Strain; a painful debilitating tear to a muscle. Nipping tightness in the bud with massage can help to reduce the likelihood of straining a muscle. A Hypertonic muscle has more than normal tone, it will feel hard and inflexible and is prone to the accumulation of trigger points when left. Golgi tendon organs are proprioceptive sensory receptors that are located at the Origin and Insertion of a muscles in tendons. There job is to sense muscle tension. Much like tightness when the muscle has too much resting tone it cannot relax efficiently allowing it to recuperate and renew. Instead the muscle is hold in a persistant state of contraction which fatigues it, leading to a pain cycle. Much like tighntess this will inhibit a normal fascial environment leading in turn to nerve irritation, a dull aching chronic pain, the formation of trigger points with their associated pain referral patterns. Tightness and Hypertonicicity are what are thought of as normal abnormalities, and they occur to most people and dogs at some point in their lives. However if a dog is already living with a pre existing orthopaedic condition such as Hip Dysplasia or Arthritis or if they have sustained a muscular or soft tissue injury, something as straight forward as these 2 conditions can not only significantly contribute to the dogs pain levels, it can make the condition worse as the range of motion on the joint is restricted, furthering pain and inhibiting movement and mobility. These 2 muscular conditions will also hinder the ability of performance and sporting dogs. In agility where muscles are required to continually lengthen and then return to a normal state for optimal performance, tightness and hypertonicity can cause performance changes and make a dog prone to muscular tears or Strains. Hypertonic muscle responds incredibly well to massage within just a couple of sessions. Hypertonic muscle is rigid making movement stiff, painful and sore. Massage can transform the muscle back to its optimal function with fibres that can lengthen and contract efficiently, fascia that is able to respond to changes and pressure elicited from the muscles, and sensory neurons that are able to feedback normally. 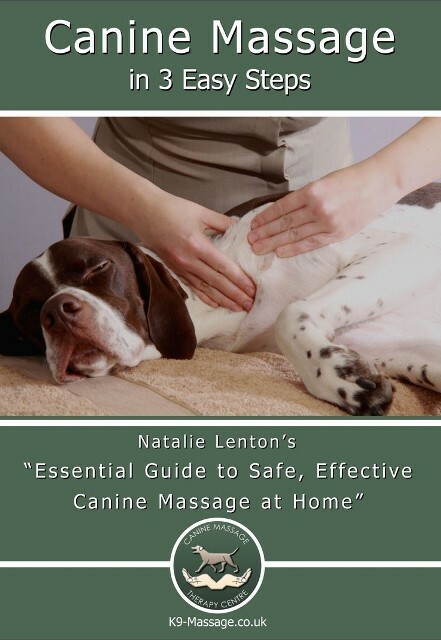 The result is supple, flexible muscle that has had the pain resolved so the dog can return back to normal activity, if total resolution cannot be achieved at the least massage should improve the comfort levels and mobility of the dog. Hypertonic muscles contribute to the process known as Protective Muscle Splinting. Massage will help to free adhesions that restrict fascia, soften and loosen the tissue and promote its natural return to flexibility and pain free movement. Owners report that dogs who have been showing signs of stiffness, or who had to have their exercise reduced, are showing signs of ageing or living with arthritis, after Canine Massage are happier, brighter, able to return to normal exercise and have back their general zest for life.